The Moth Worlds fleet woke up to the wind blowing a steady 15 knots, the sun shining and by 1000 it had already reached 23°C - perfect sailing conditions. The Gold fleet went out into Hayling Bay, while the Silver fleet headed off East to Bracklesham Bay. Two races where held for the Gold fleet, where the Brits took a clean sweep of the podium (Chris Rashley 1st, Ben Paton 2nd, Dylan Fletcher 3rd) in the first finals race, only for the Australians to come back fighting with their own clean sweep in race 2 (Nathan Outteridge 1st, Rob Gough 2nd, Josh Mcknight 3rd). Overall, this has given Chris Rashley the outright lead after Robert Greenhalgh had a poor day by his standards to drop to 5th overall. Nathan Outteridge has moved up to 2nd overall after a 4th and 1st, staying just 3 points off Rashley's score. Josh Mcknight has moved up to 3rd with consistent top 5 results, but the big mover of the day was Ben 'The Patonator' Paton, who moved from 9th to 4th on the leaderboard with a 2nd and a 5th today. Nathan Outteridge (AUS 2) said, "It was good. We finally had some breeeze, over 12 knots at times. I wasn't starting very well but I was getting the first shift in the front pack each time and got a 4 and a 1 so pretty happy with that." Outteridge said of the contest between the Brits and the Aussies: "They've (the Brits) got the home advantages so it would be embarrassing if they lost to be honest. We're just out there trying to get around the race course and not really worring about the other boats, but Rashley's sailing really well, as is Ben Paton, and Rob had a bit of a shocker today by the looks of it, so we'll just wait and see." Ben Paton (GBR 4), who's 2nd and 5th places moved him up to 4th overall said of his day, "Pretty sick mate, pretty sick. 4th overall, matches my sail number, just need to improve on that. 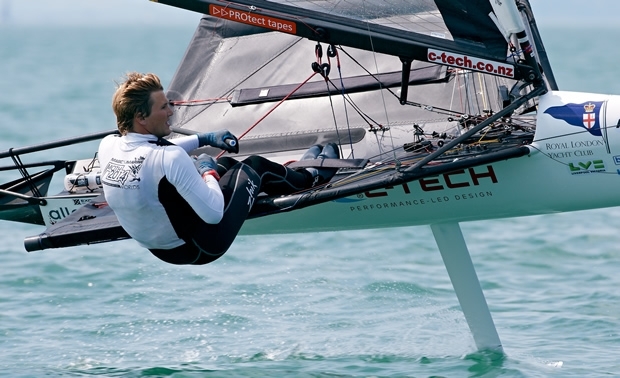 I made sure I was on my foils at the start and I wanted to keep to the right hand side as I thought the pressure would go there and just make sure I was on the right of the fleet and tacked up on the shifts. I think I got to the windward mark 2nd in both races. I was a bit conservative in the 2nd race and lost a couple of points, but to come off the water with a 2nd and 5th is pretty cool. On the #MothAshes rivalry Paton said: "We're going to have a head-to-head race later on hopefully so that'll be the true test. Men versus boys." Japanese sailor Hiroki Goto (JPN 3989), who is 16th overall, described his first day of Gold fleet racing, "I was wanting to be in the top ten results today, but it's tough, more than doubly tough as qualification races. It is one of the most experienced and skilled fleets in the world so, regardless of the results, every moment I'm enjoying so much. I'm so proud and feel so lucky to be here, to join this fleet - amazing. I'm just hoping for more wind, more races and more fun. It's insanely tough, but at the same time it's insanely fun so I just want as many races as possible." Tom Offer (GBR 4038), who scored a 7th and 8th to remain in 8th overall said: "There were big patches in the breeze in both races, keeping clear air was an important factor, especially at mark roundings. If you got to the mark in clear air it was easier to stay on the foil but if you were in a bunch of boats then it was easy to end up low riding around the mark. Also, getting a good breeze line was a big factor, it allows you to ride high all the way on a leg. However, getting a better breeze line was more by luck than anything else today, it was very patchy out there." Home builder Richard Edwards (GBR 3943) described the battle for the home build cup: "One each, but shall we just say Gold fleet racing is a different ball game, the standard at the top end is stratospheric. We did all right, Phil (Oligario) got one and I got one, but I was 5th from last in one, but hey, that's what you get in the Gold fleet." Thomas Lambert (GBR 4072), who is 2nd after the first day of Silver fleet racing said, "It was very good today, the wind started off ok and then died off, but I'm quite small and suited to the lighter breeze and it went really well. It was good to get 3 races in, there was a point in the last race that we weren't sure whether they were going to abandon, but no, it was really good to finally get a day with 3 races." German helm Carlo Maege (GER 3843), who is currently 7th overall in the Silver fleet, described today's racing, "Racing was very interesting because we had a few big shifts and we had different gusts on the right and left side, sometimes the left paid and sometimes the right, so it was really hard to stay near the front. I'm one of the old guys and here to have fun and I'm not only here to be on the podium. Maege added of his compatriot, Sven Kloppenburg, who is currently leading the Silver fleet, "Sven will be very happy to be first in the Silver fleet because yesterday he heard that there may be a possibility of the first two boats changing to the Gold fleet after the first day. He's been German champion 11 times and it's his first worlds where he hasn't been in the Gold fleet, so he was a bit disappointed after the qualifying series." Firefly UK Champion Jono Pank (GBR 3787), who is currently lying 32nd in Silver fleet, described his day, "Snakes and ladders on the Silver fleet course, some foiling, some not, slam the beach and get lucky sometimes and not others. An up and down day."